May only exist as a design. 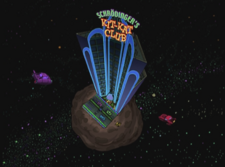 Trendy night spots, such as Schrödinger's Kit-Kat Club, were designed by Professor Farnsworth in his tiny one room apartment while he was living the life of a scientist. He invented fast cars and beautiful women in that room too. Schrödinger's Kit-Kat Club is a reference to Erwin Schrödinger's Schrödinger's cat thought experiment in quantum physics, as well as the Kit-Cat Club, an 18th century London literary and political group. This page was last edited on 15 February 2016, at 21:06.